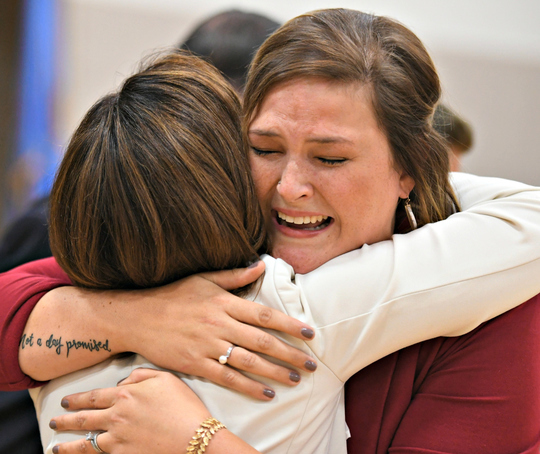 State Superintendent of Public Instruction Joy Hofmeister hugs kindergarten teacher Hailey Couch, who was surprised with the $25,000 Milken Educator Award at Madison Elementary in Norman. To watch her reaction, click here. To see more photos from the Milken Family Foundation, click here. Oklahoma faces many challenges, but it is also home to thousands of teachers who are fierce champions for children. 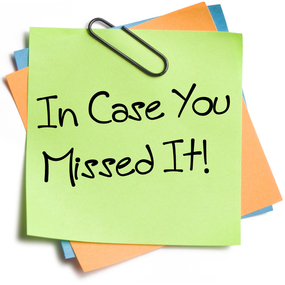 When thousands of you took to the State Capitol last spring to advocate for your students and share stories of your classrooms, your message was loud and clear – a one-time pay increase was not enough to appropriately fund public education. Last month, I proposed a 2019-20 budget request of $3.35 billion for common education – an increase of more than $440.6 million over the current year. The State Board of Education approved that proposal, and in February it will go to a Legislature with more than 50 new members, many of whom ran on a platform that focused on public education. 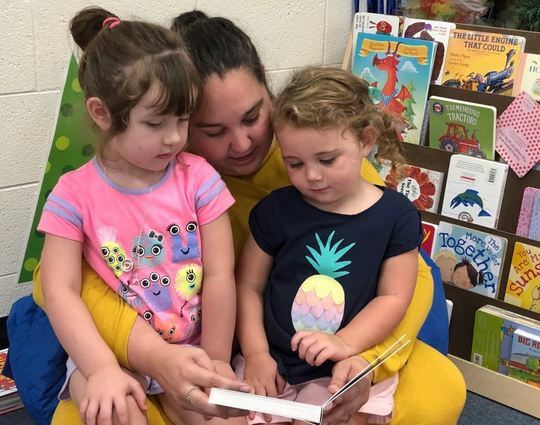 With this level of funding, we can reduce class sizes and boost critical funding for instruction after years of severe cuts that have negatively impacted every classroom in the state and fueled a severe teacher shortage. This budget represents a strategic investment in students and teachers. Increasing instructional dollars is Oklahoma’s next significant step forward. We must not lose momentum; we must continue to fight for kids. I am honored to be serving a second term as your state superintendent, and I look forward to continuing to stand with you as we bring a brighter future to Oklahoma. The Legislature will consider the 2019-20 state education budget when the new session begins Feb. 4. This budget reflects priorities echoed so loudly by teachers this spring – to restore operational dollars and strategic investments in students and classrooms. Next year’s budget includes an increase of $440.6 million and would put an additional $273 million into the state funding formula. This infusion would allow schools to hire additional teachers to narrow the widening gap between the number of students and teachers that has developed over the years. The goal is to re-establish class size limits set forth in 1990’s House Bill 1017: elementary classes capped at 20 students and secondary teachers limited to a total of 140 students. Other large line items include the state’s responsibility in funding health insurance for teachers and staff at $503 million and instructional materials or textbooks at $40 million. There is also a new $58 million line item for counselors, the School Counselor Corps. The American School Counselor Association recommends a 250-to-1 student-to-counselor ratio. However, in Oklahoma, the ratio is 435-to-1. This new funding would provide for more academic counselors to help with student career planning and licensed professional counselors to meet the mental health needs of students. To see the complete budget request, click here. Creating a safe learning environment is critical for preventing behavioral disruptions and difficulties in your classroom. Three major components can help you achieve this goal: classroom structure, teaching behavior and effective classroom management strategies. Asking a few simple questions of yourself and your students can foster a safe, trusting classroom environment. Questions for students: Give your students an opportunity to express any concerns or difficulties they would like you to know. What are some ways I deal with frustration and/or anger? When I am frustrated, what is one thing I can do to self-regulate? What is the one class I am having the most difficulty in? What is one thing I wish teachers knew when my frustration level is high? What could my teachers do to help me have a successful year? Questions for teachers: Use these as a self-reflection activity. Is there a certain time during the day when behavior problems increase in my classroom? Do my students understand what I expect from them daily? Do I have too much idle time in my class? Do I need to rearrange my classroom? Do I have too much clutter? Too many visuals? Are the materials in the class easily accessible? 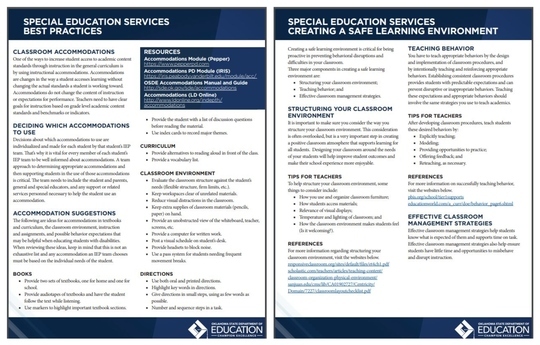 For more tips and handouts from OSDE’s special education experts, click here. A new video available to educators shows how easy it is for students to forge meaningful connections with professionals. 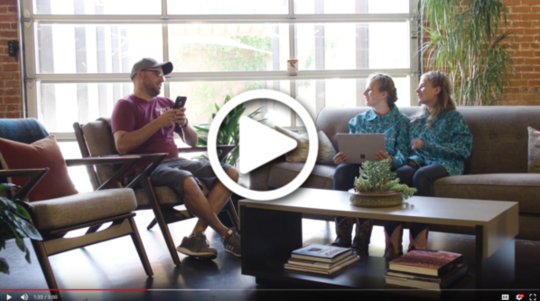 Employing a “fly on the wall” approach with a hidden camera, the OSDE video features students from Macomb, Oklahoma City and Shawnee asking for help from four professionals – an accountant, a graphic designer, a financial officer and an engineer. To watch the five-minute video, click here. It will be featured on the Oklahoma Edge platform, an online learning community OSDE plans to launch early next year funded by a $2 million New Skills for Youth grant. Also in the works is a career-readiness website that offers multiple connection points for students, families, educators and business leaders. To learn more about the Oklahoma Edge online learning community, click here. PRESIDENTIAL AWARDS: Nominate a deserving secondary teacher in your district to win $10,000 and the Presidential Award for Excellence in Mathematics and Science Teaching. Anyone – including principals, teachers, parents, students, business leaders or members of the general public – may nominate exceptional mathematics or science teachers in grades 7-12. The deadline is March 1. Teachers may also apply directly. For more information, click here. FREE TRAVEL GUIDES: The Oklahoma Tourism & Recreation Department is offering free boxes of its 2018 Oklahoma Travel Guides to teachers. The travel guides contain over 200 pages of beautiful photography and information on destinations across the state. Guides must be picked up at the Oklahoma City warehouse. To request your travel guides, call (405) 522-2455. 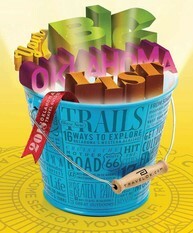 To view Tourism’s online teacher/student guide to Oklahoma, click here. FREE PD: OSDE is presenting free professional learning workshops in December in Oklahoma City and Broken Arrow that are aligned to the Oklahoma Academic Standards. These workshops are perfect for educators looking to identify a new Professional Learning Focus or deepen their expertise. To register for a workshop, click here. SCIENCEFEST: Fourth- and fifth-graders statewide are invited to participate in this hands-on annual event May 2 at State Fair Park in Oklahoma City. Stations use basic geology, biology, physical sciences, health and environmental sciences to demonstrate how science impacts everyday life. Space is limited to 3,500. To register and for more information, click here. Teachers always need funding for classroom projects and professional development. Fortunately, our state has over 220 educational foundations, ranking it among the top in the nation per capita. Their goals? To provide teachers and students enrichment opportunities through grants and scholarships. Teachers, I encourage you to take advantage of these funding opportunities. A major purpose of foundations like these is to enable teachers to be innovative. The impact on your classrooms can be dramatic. Local foundations: I have been fortunate to be the recipient of several of these grants from my local Broken Arrow Foundation for much-needed supplies that have given my students access to innovative projects involving drones, solar trees and sustainable watering systems, to name a few. For a list of school foundations in Oklahoma, click here. 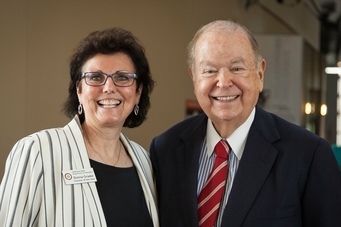 Oklahoma Foundation for Excellence: OFE, founded by David Boren (left) funds opportunities for teachers to attend the Colonial Williamsburg Teacher Institute and as well as professional development grants. Fund for Teachers: This national organization supports educators by allowing us to design unique fellowships relevant to our curriculum. I received two fellowships to travel to Kenya to lay the foundation for subsequent student service-learning trips there to provide protein for orphans. STUDENTS HELPING STUDENTS: When students at Jones High School heard about students at Northwest Classen High School in need of toiletries and personal care items, they rushed in to help. A supply drive commenced, and the students even collected a washer and a dryer. To watch the story, click here. SPECIAL GUEST: Miss Oklahoma Ashley Thompson visited students at Washington Irving Elementary in Durant for Red Ribbon Week. To watch the story, click here. 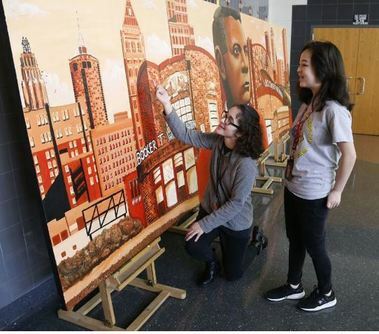 SCHOOL PRIDE: Booker T. Washington High School’s fine arts students spent the past seven months painting a massive, 80-square-foot mural that pays tribute to their school’s namesake. To read the story, click here. LESSONS FOR LIFE: Mustang High Schools is giving seniors a taste of adulthood with a full day devoted to the next steps after graduation. To watch the video, click here.